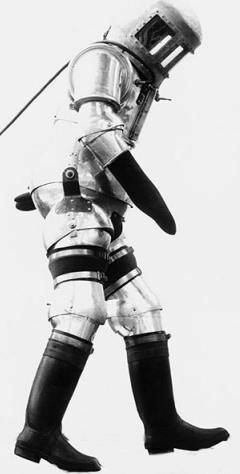 German pressure suit, developed 1935-1945. Draeger-Werke developed a hard shell full pressure suit for the Nazi government. The Draeger-Werke, a German diving suit builder, built a full pressure suit of laminated silk and rubber in 1935. However under pressure the ballooning soft suit pressed the visor painfully against the pilot's forehead. The firm's engineers Tietze and H Ide then experimented with hard suit designs with ball joints. By 1942 these began to resemble similar suits developed by NASA in the last quarter of the 20th Century. Suit pressures of 0.75 bar were achieved without 'sacrificing mobility', but the suits were too heavy (at least for the intended 1-G use!). By the end of the war suits were developed with separate oxygen breathing and suit gas systems. Aside from speculation the ultimate objective was use in actual spacecraft (such as von Braun's manned A4b V-2 derivative), the suits were believed to be intended for use by pilots of the Horten Ho IX flying wing bomber. Draeger continued after the war with various anesthetic-delivery and breathing systems, turning again to aviation and space pressure systems. They participated in subsystems for the cancelled ESA-2000 space suit. Family: Space Suits. Country: Germany. Bibliography: 487.